Curated by Senior Curator of Contemporary Art Kristen Hileman. 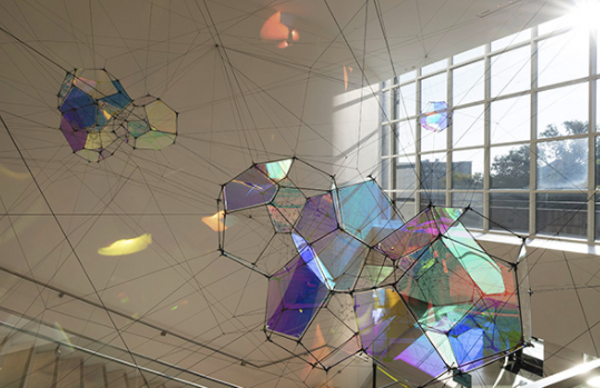 Internationally acclaimed artist and trained architect Tomás Saraceno uses iridescent panels, spider webs, and inflatable orbs in three fascinating sculptures on view. The centerpiece of the exhibition, Entangled Orbits, transforms the East Lobby with clusters of iridescent-paneled modules held in place by strings reminiscent of a spider web. Appearing somewhat like bubbles, these spherical modules evoke the artist’s visionary plans for “cloud cities,” which look to naturally occurring forms for inspiration and might provide environments for future human habitation. Similarly, the intricate spider web of ropes refers to a natural structure that encompasses the qualities of strength, beauty, and flexibility.